Dev IQ’s approach to software development is heavily grounded in empathic design – the idea that innovative solutions should be focused on the real needs of people, rather than high style or brand perception. One of the keys to this methodology is developing a Minimum Viable Product (MVP) from which we gather feedback and learning that can be implemented back into the product as part of a continuous learning-and-development loop. But how do you decide what to start with? Which features are sufficient to get enough valuable feedback to begin to iterate and improve? 1. Build minimally, but span the full hierarchy of development needs. Minimal effort doesn’t mean that you throw out the foundational concepts of good design. 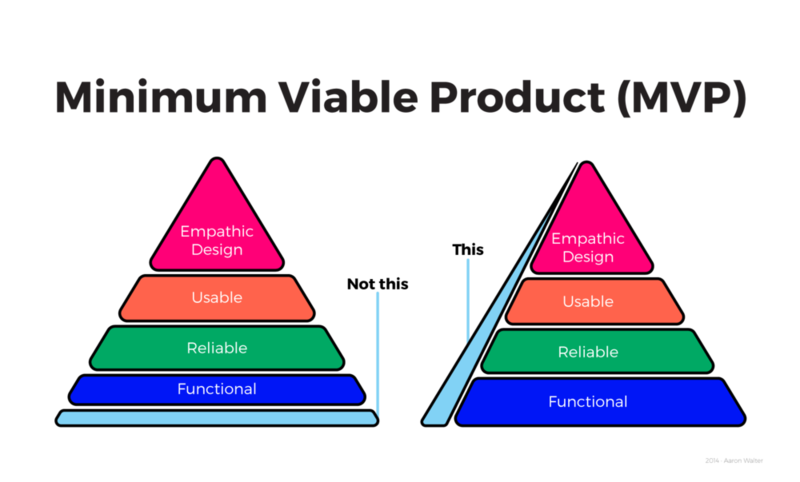 In fact, the ideal MVP should be developed using a vertical slice of the full pyramid of design needs rather than just focusing on the lowest functional level. This will ensure that the feedback you receive is applicable to the full-fledged product you are creating – including UX, features list, and so on – rather than just the base-level, functional components. 2. Your MVP must have unique value. The MVP equation, as envisioned by Dev IQ CEO Shawn Davison. 3. Be prepared to learn. MVP is all about continuous learning. The first iteration of your product may fail. That’s ok. In fact, that’s what this process is for: to validate your design and unique value early, with minimal effort, so you don’t waste valuable resources creating something that’s fully-baked, but not fully-optimized. While the insights you glean from your MVP might be unexpected or counter-intuitive, listening to this feedback is crucial to ongoing product development and success. 4. Make MVP a mindset. While companies often think of MVP development as a one-time process, we believe that MVP should be an organizational mindset. Every time a company encounters a business challenge, MVP’s iterative process of “build-measure-learn” provides an excellent framework for meeting that challenge in an informed, methodical manner. An MVP serves as the bridge between an idea and an end product. When developed and scaled correctly, an MVP can offer incredible insights that will help you create a more successful product. The key is knowing where to begin, and what’s enough to begin with. Thoughtful design, unique value, openness to learning, and an MVP mindset are four simple ways to ensure that you’re getting your MVP right. If you’re developing an MVP, and you’re looking for deeper insight on how to optimize its design and development, we’d love to chat! CEO at Dev IQ, triathlete, and technological philosopher.